Which Test Cases would you write for Testing a Coffee Cup? Have you ever come across such questions? :) Well; as a beginner many times we come across such questions during an interview? 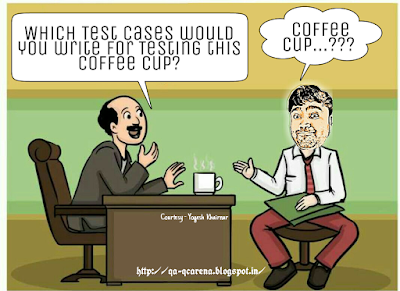 I reckon; the idea of asking such questions is to study the candidate and his/her mentality as a Software Tester. Below are some of tips to answer such questions. Ask the interviewer whether there are any specific requirements specifications available? If yes, then certainly that will help you to prepare Test Scenarios and Test Cases. Even if there are no requirements specifications available, just by looking at the Test Object you can write the Test Cases. First of all, understand the System or Test Object. Try to understand what the System or Test Object does? This will help you to prepare the Test Scenarios and Test Cases for Functional Testing. Then try to understand how well the System/Test Object works? This will help you to know the Quality characteristics or Non-Functional attributes of the test object and to prepare the Test Scenarios and Test Cases for Non-Functional Testing. Remember; it is important for Testers to have good observation skills, ability to develop Systems Thinking (a mindset or perspective for understanding the system behaviour and its workflows). And this is your opportunity to prove yourself. 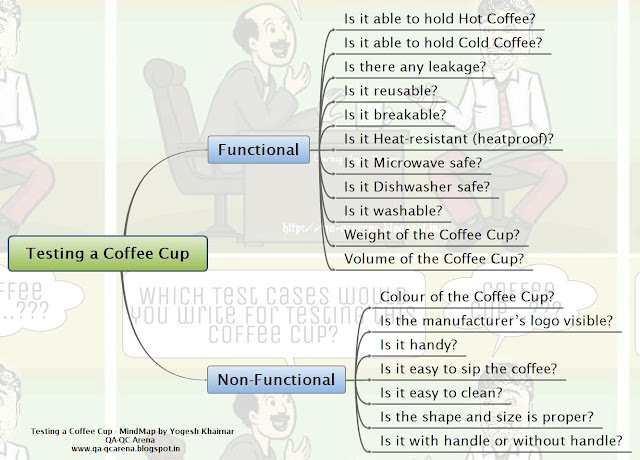 Below is a simple Mind Map which covers some of the scenarios that can be considered in order to test a Coffee Cup. Certainly there can be more test ideas that can be added to the below scenarios. Do subscribe to QA-QC Arena for more such details. 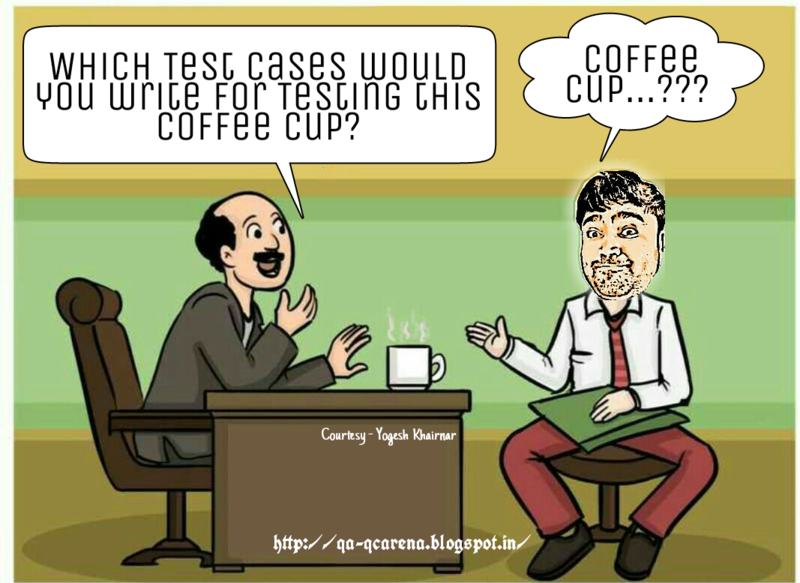 Good one...most of times its also been asked about the test cases on AC. How long the coffee will be Hot/cold? So, if I grabbed the coffee and say I take ownership of the cup.... ask your next question. When he asks for his coffee, sorry you have insufficient access rights to the cup, please contact your System administrator. As an example of a test I might run. QA-QC Arena is a personal blog written and edited by me. It is not sponsored or supported by a company, organization or group of organizations. Information provided here is correct to the best of my knowledge. Software Testers; what’s your New Year resolution? © 2019 QA-QC Arena. Innovated by YRK. Powered by Blogger.